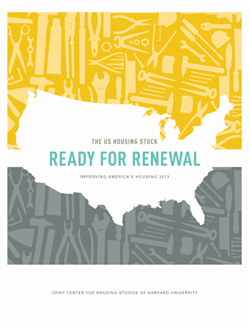 After languishing for several years, the U.S. remodeling industry appears to be pulling out of its downturn, and a renewal of the nation’s housing stock is underway, according to the Joint Center's new remodeling report, The U.S. Housing Stock: Ready for Renewal. Foreclosed properties are being rehabilitated, sustainable home improvements are gaining popularity, older homeowners are retrofitting their homes to accommodate their evolving needs, and the future market potential is immense, as the emerging echo boom generation is projected to be the largest in our nation’s history. As baby boomers move into retirement, they are increasing demand for aging-in-place retrofits. A decade ago, homeowners over 55 accounted for less than one third of all home improvement spending. By 2011, this share had already grown to over 45 percent. And generations behind the baby boomers will help fuel future spending growth since echo boomers are projected to outnumber baby boomers by more than twelve million as they begin to enter their peak remodeling years over the next decade. Additionally, the surge in distressed properties coming back onto the market is contributing to an increase in U.S. remodeling spending. After limited spending during the housing bust, renovating the more than one million distressed properties that were sold in 2011 contributed nearly $10 billion to home improvement spending. With about three million more foreclosures and short sales in the pipeline, there is even more such spending ahead of us. Average homeowner spending on remodeling was 20 percent higher in the Northeast and 10 percent lower in the South, compared to the national average in 2011. Since the 1990s, however, the Sunbelt metro areas have generally seen stronger growth in home improvement spending. As of 2011, metro areas with the highest per owner improvement spending included the rapidly growing Sunbelt metros of Austin, Las Vegas, and Phoenix, as well as traditionally stronger markets such as Boston, New York, San Francisco, and Washington, D.C. Spending on energy-efficiency upgrades, in particular, continued to expand through the remodeling downturn. The share of total market spending on energy-related projects rose sharply from 23 percent in 2007 to 33 percent in 2011. About a quarter of households undertaking home improvement projects in 2011 did so for energy efficiency purposes. Read the full report on the JCHS website.